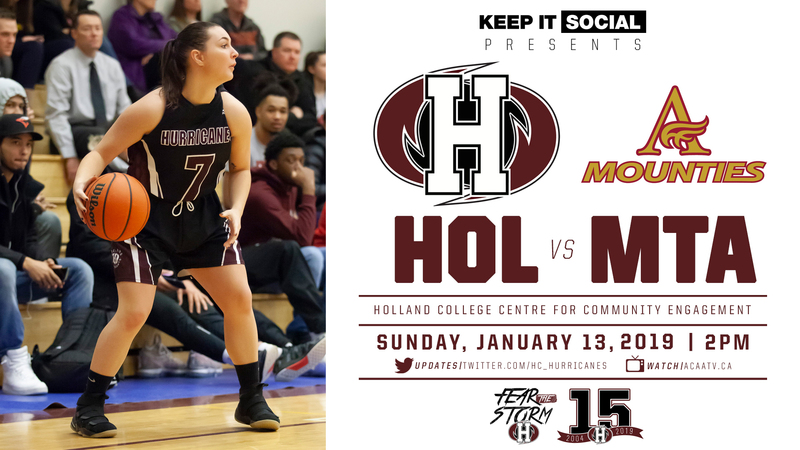 The Holland Hurricanes men’s and women’s basketball teams return to the court this weekend when they travel to Saint John, New Brunswick to take on the UNBSJ Seawolves on Saturday, before returning home to host the Mount Allison Mounties on Sunday. 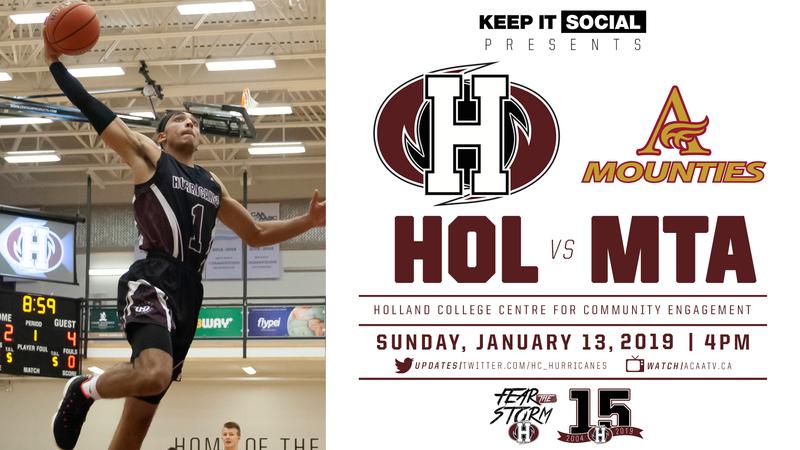 Saturday’s games take place at 1 and 3pm with games scheduled for 2 and 4pm on Sunday at the Holland College Centre for Community Engagement (w/m). The women’s Hurricanes begin the 2019 portion of their ACAA regular season sitting at 3-5 and tied for fifth place in the standings alongside UNBSJ. The Mounties are 5-3 and in third place. Everyone is chasing the conference leading MSVU Mystics who sit atop the standings with an 8-0 record. This season the ‘Canes dropped their only matchup versus the UNBSJ Seawolves, losing 83-76 on November 4 in Saint John. This will be the first time the Hurricanes have faced the Mounties this season. An addition to the roster in the second half of the season for the Hurricanes is Danielle MacKinnon. MacKinnon is a 5’6” guard from Valleyview, Alberta; she will wear number three. The men’s Hurricanes sit in first place in the ACAA standings with an 8-0 record this season, while the Seawolves are in a tie for fifth at 3-5 and the Mounties are tied for third at 5-3. The ‘Canes defeated the Seawolves in their only meeting this season, a 107-72 victory on November 4; the ‘Canes and Mounties have yet to square off this regular season. The Hurricanes will see the return of Travis Adams to their lineup in the second half. The 6’3” forward from Halifax, Nova Scotia begins his second stint with the Hurricanes; he previously was a member of the team from 2015-2017. With 41 career games logged as a member of the Hurricanes, Adams averaged 15.68 points and 7.27 rebounds per game. He was named an ACAA second-team All-Conference player in 2016. The men’s Hurricanes enter the second-half of the season at number two in the CCAA’s national rankings. Catch all the action this weekend by watching the live stream at www.acaatv.ca. For more information on the 2018-2019 ACAA basketball seasons, visit www.acaa.ca. Connect with the basketball Hurricanes at www.twitter.com/caneswbball and www.twitter.com/canesmbball.